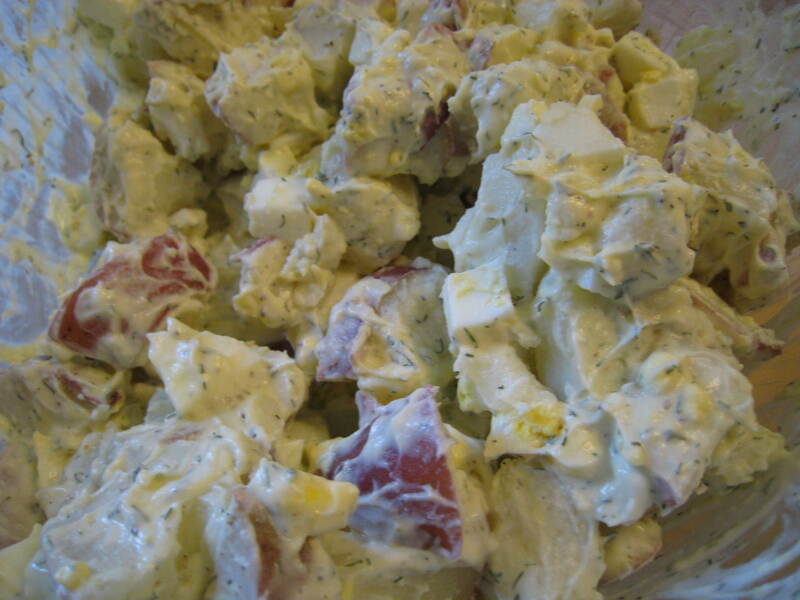 I’m not a huge fan of potato salad, but wanted to try to find a recipe that I liked since my daughter and husband are big fans of potato salad. I love red potatoes and this was the perfect salad. I adapted it slightly from the original recipe on Allrecipes, but it stll turned out great! Place the potatoes in a pot with enough water to cover. Bring to a boil, and cook for about 10 minutes, or until easily pierced with a fork. Drain, and transfer to a large bowl to cool. In a medium bowl, mix the sour cream, mayonnaise, mustard, vinegar, eggs, and hot sauce. Season with dill, garlic powder, onion salt, salt, and pepper. Pour over the potatoes, and gently toss to coat. Chill at least 3 hours in the refrigerator before serving.